This book combines the business start-up knowledge and cake decorating experience of people like you from around the world who have successfully started home businesses. Has anyone ever said to you, "Your baking is so delicious, or your cakes are so beautiful... you should go into business!?" Have you ever taken a cake decorating class and thought, "How could I turn this into a career?" Perhaps you just enjoy working in the kitchen and want to learn how to start a real home-business. Whatever your reason for choosing cake decorating as a business, this book offers the expertise and solutions to the many situations you will encounter as you start your journey as a business owner. This book combines the business start-up knowledge and cake decorating experience of people like you from around the world who have successfully started home businesses. Reader Nakale Ayovunefe from Clarkston, GA, says,"This book is indeed written by an angel. I was always frustrated when I would search on Google for a book that talks about starting a cake decorating business and come up with little or no result. I had no choice but to print out E-zine articles. I almost paid a start up business consultant five hundred dollars. The author of this book covered everthing from marketing to State Department of Agriculture list, and provided website addresses. I read this book religiously. My husband also likes the book. For those who are planning on starting a cake designing business, look no further. This is it!" Reader Crystal H. from utah, says,"This book was exactly what I was loooking for. My husband (has a business degree) said this is the best book I have ever spent money on. 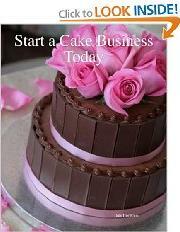 It really does cover everything you would need to know about starting your own cake business. There are also a ton of great references and web adresses to find out more. If you are even thinking of selling cakes this book is a must!